We’re nearing the end of the first shopping week – how is it going? I had grand plans of posting some of the top deals for the week, but that didn’t happen. I will try for next week’s deals next Monday. The big news is that we officially have a non-profit partner: the Henrico Education Foundation! It supports programs, scholarships, and more for Henrico County Public Schools. HEF already has a “School Supply Challenge” through which it encourages businesses and community groups to collect supplies for challenged schools. 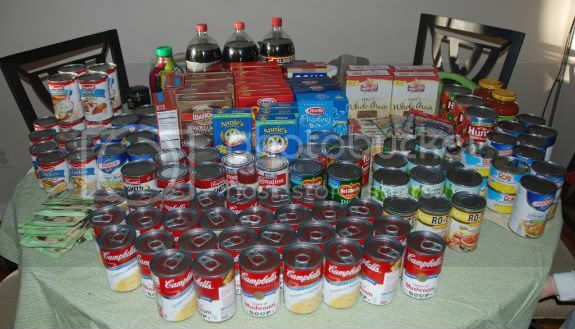 The supplies that we purchase for our challenge will go to help Henrico High School and several East End elementary schools. While anything goes as far as what you can purchase for the challenge (anything school-related of course) and it will all get used somewhere, the Henrico Education Foundation does have a list of supplies it requests, which might be worth keeping in mind while you’re trying to decide what deals to buy – you an view it here. My wife just found a great deal on highlighters and expo dry erase markers at Office Max. Inside the store is a $5 OFF coupon on three items. We found (3) packages of Sharpie’s for $5…making them completely free. Coupon is limit one per person per transaction. Look for it at the Sharpie’s display. There’s still oodles of time to join in! I haven’t made much progress beyond getting a raincheck for crayons at Kroger. I did swing by Walmart yesterday and scope out the school supply section, which was just being assembled. Walmart isn’t great for this challenge, because it already has low prices and doesn’t offer deep discounts off of those. 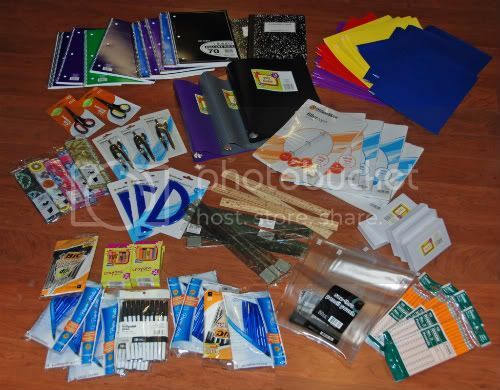 But if you are in the market for supplies for personal use, it had Elmer’s glue sticks for $.10 each, generic glue sticks “3 for $.25,” generic colored pencils or washable markers for $.50 each, and 1-subject notebooks for $.17. For more information about the Challenge, check out last week’s post! The event began in 2010 when I challenged a few fellow frugal bloggers to a friendly competition to see who could stretch a small budget the furthest. I love shopping school supply deals, but needed a good excuse and great cause 🙂 The four of us spent $40 to accumulate $500 worth of supplies to donate to the Fulton Hill Neighborhood Resource Center. Here’s the recap post. Last year, with help from Kroger and the Hodges Partnership, and orchestrated by Eleanor at Saving Our Way, we opened the challenge up to anyone who was interested and 16 shoppers collected over $3,000 worth of supplies to donate to the Boys and Girls Clubs of Metro Richmond. You can read my recap post here. My individual total was $104.87, which palls in comparison to the winner, Erin McGarvey, who stretched $10 to get $567.74 worth!(!) That is a 98.2% savings, folks. This Sunday, the Challenge starts again – join us! A. It’s a great cause. Well, it will be for a great cause – kids! 🙂 I’m still finalizing exactly which of many worthwhile Richmond organizations will receive this year’s supplies, and I will update that information as soon as I can. Update – we’ll be working with the Henrico Education Foundation – more info here. B. It’s fun. If you’ve never tried, you’ll be surprised how many school supplies $10 buys when you are shopping the back-to-school deals! Anyone who participates (see terms below) has a chance to win! The Challenge runs 7/15/12 (this Sunday) to Tuesday, August 14. Purchases must be made in that time frame. You can spend a maximum of $10, excluding tax. Rebates do not count to your total. Save all your receipts, and keep records of your spending and saving (including where and when you made purchases, what the retail value was, what discounts you used, and how much you spent) There is a spreadsheet available on Google Docs if you could use help with the calculations. Go here. Your final total – how much you spent, and the total retail value of items – must be submitted by Wednesday, August 15th, 2012 at noon EDT. SUBMIT TOTALS USING THIS FORM. On Wednesday, August 15th, we will gather at Tuckahoe Library (1901 Starling Drive, Henrico, VA 23229) at 4pm to collect everyone’s collections, recognize the top frugal shoppers, and to select prize winners. If you can’t make it at that time, I’ll be happy to make other arrangements with you to pick up your stuff. To be eligible to win one of the prizes, you must collect at least $40 retail value worth of supplies with your $10 budget (75% savings). This is so easy to do I am almost insulting your frugal intelligences by making it the minimum. (If it sounds daunting, I’d be happy to give you some ideas of where to start!) The point of the challenge is to challenge yourself! You must also provide your receipts and documentation if you are selected a winner, but you don’t have to be present on August 15th to win. More fine print: No more than one prize per person. Participants will be assigned a number based on when their totals were received (first = 1), and from the total number of eligible participants, Random.org will be used to select the winning numbers. Donation must be received before prize is distributed. Questions? Shoot! You can also hang out on the RVA Coupon Pros Facebook page to ask questions, share tips or photos, etc. 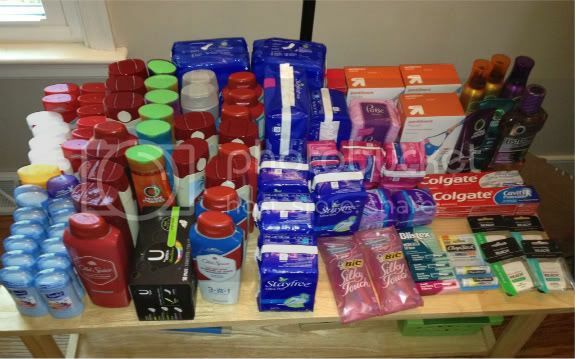 We wrapped up the latest frugal challenge this week, collecting toiletries to donate to Freedom House on a $10 budget. All in all, there were five of us participating – Me, Ann, Tiffany, Eleanor, and Zoe – and we collected a total of $260.01 worth spending $44.61! My total was $52.63. This round’s winner was Ann; she took advantage of Martin’s fuelperks, among other strategies, to pick up $82.94 while spending less than $7! Tiffany came in second with $66.35. As the sales played out this year, we picked up lots of cheap Old Spice body wash and deodorant ($.49 each with coupons during Kroger’s P&G sale) but almost no toothpaste. The small Suave deodorants and Carefree liners were less than ten cents each at Kroger after doubled $.50 coupons.